RED, WHITE, PINK AND MARBLE ARE AVAILABLE. PLEASE GIVE PLENTY OF NOTICE FOR A LARGE QUANTITY OF SPECIAL COLORS. PRICES ARE CASH AND CARRY ONLY AND DO NOT INCLUDE FOIL OR POTCOVERS. 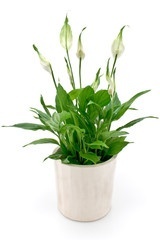 One of the most beautiful and easy houseplants for the novice plant lover is the Peace Lily. The deep green foliage is often accentuated with exotic white spaths that shoot out of the center of the plant. The Peace lily is not at all demanding. It will thrive in almost any light situation other than full hot sun or deep shade. It does like to be moist at all times and will droop if it gets too dry but is quite forgiving and will perk right up after it gets a drink. They are also happy in almost any indoor temperatue from 65 to 90. Just make sure they are never are exposed to a frost. There are several species of Spathiphyllum to choose from. While all have white spath like flowers, some are large plants, some medium and some quite diminutive. The largest Peace Lily is the Spathiphyllum Sensation. This plant can get to be 5 or 6 feet tall and while it seldomly blooms, the flower is quite impressive. There are several intermediate cultivars such as “Sweet Pablo” and “Supreme” and miniatures like “ Spath. Petite”. For the most part, Peace Lilies are disease and insect resistant, but occasionally they will attract mealy bugs. If caught early, these can be cleaned up with an alcohol and water mixture, applied directly to the insect with a Q-tip. Heavier infestations can be cleaned up with an insecticide. Occasionally Peace Lilies get root rot from overwatering. This is a very difficult problem to correct and it’s best to make sure your plant is in a container that drains well, as it is never advisable for any houseplant to sit in soggy soil. One of the first signs of spring at your local garden center in the North East and Mid Atlantic is the arrival of flats and pots of spring Pansies and Violas for planting. After a long, cold winter, gardeners and non gardeners alike crave the warm, rich colors of Pansies and Violas to brighten up the grey skies. Many people are unsure of the difference between Pansies and Violas. Generally Pansies have a larger “face”; markings in the center of the flower that often resemble a face. Violas are usually referred to as having a smaller flower but much more of them on a plant compared to Pansies, but with the new breeding by some top growers here and in the UK, Violas have come a long way on flower size. We personally find Violas to be more vigorous in the garden. Ours are grown in full sun to fairly heavy open shade and have good success. They are practically insect and disease free, but watch out for slugs. Rabbits and Woodchucks never bother my pansies or violas, but understand that deer will eat them. Once established they require watering only during really hot and dry weather. Plants usually begin to fade by late July and are too ratty to leave in the garden by mid August. The other big dilemma gardener’s face with these plants is whether to plant them in the fall or the spring. 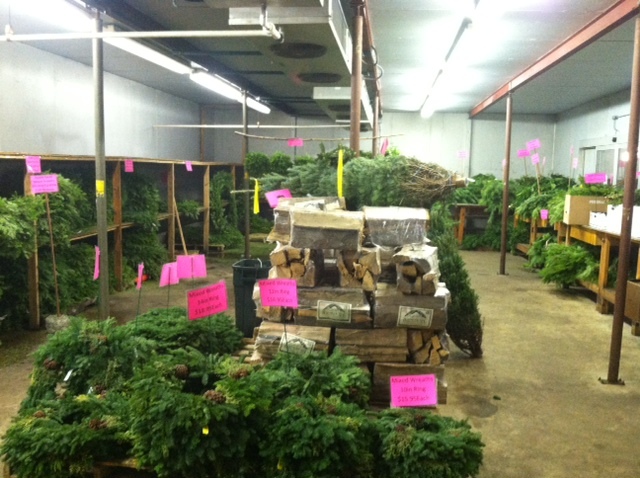 Most people think that the plants sold in garden centers in the fall are just for the season, like fall mums. But that is not the case. 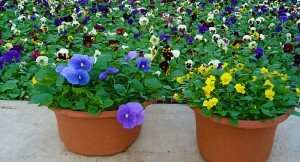 We always plant pansies and violas in October and even November for the following season. Once established, they withstand the coldest, snowiest winter weather and by March or April are already growing and blooming profusely. The advantage of planting in the fall is a more established plant should hot weather come early. And they seen to last longer into the season than those planted in the spring. This method works in zones 5, 6 and 7 and we would bet they would winter over as far north as zone 4. But regardless as to whether you are planting in the spring or fall, Pansies and Violas can’t be beat for range of color, sheer numbers of blooms and ease of culture. If you haven’t tried them in your garden, you really should. Here at Metropolitan Wholesale we are often asked “what is a good floral gift for a guy” and the first thing that comes to mind is a Bonsai plant. Men have been growing bonsai in the Far East for thousands of years and for what ever reason, it just seems like a “guy” kind of plant. The most popular bonsai is the Juniper Bonsai and most often the Japanese Garden Bonsai (juniperus procumbens nana). The reason that this juniper is so popular is that it has that “old tree” look, even at a young age. And the charm of the bonsai plant is that the original Asian art forms are very old plants that have been miniaturized over decades. We have grown many different species of bonsai over the years and I can tell you that Juniper Bonsai are challenging but very rewarding as well. The most important thing to remember is to never let your plant dry out. The soil must be checked for moisture every day and thoroughly watered when drying. This can be accomplished by dunking the plant in a pot of water for 5 or 10 minutes and then allowing the plant to drain in the sink, or by slowly watering the plant to make sure it is completely moistened. Junipers also like a fairly humid atmosphere. The best way to provide this indoors is with a humidity tray which is nothing more than a water proof tray filled with pebbles and an inch or so of water in depth. It is important that the drainage hole in the bonsai container is above the water line so the plant is not saturated. The other consideration is how much light your plant needs. Indoors you should keep it near a window where it can get plenty of bright, indirect light. Ideally, We have found that an outdoor area in the summer that gets indirect light for the is the best way to grow Juniper bonsai as well as Japanese Maple, Cedars and other cold hardy plants. They thrive with the natural variation in daytime/night time temperatures and humidity and the natural rainfall and wind keep off insects such as spider mites. The main drawback to growing your bonsai outdoors on a patio or terrace is that it will dry out more quickly than indoors, so you must be vigilant. No matter where you grow your Juniper Bonsai in the summer months, it is important to give it a nice rest in the winter. The best way to do this is to keep it in an unheated room from October until March and limit, but do not suspend the watering. When the days begin to lengthen and the nights warm up a bit, you can fertilize the plant with a product for acid loving plants and start to water more often, giving it more light. 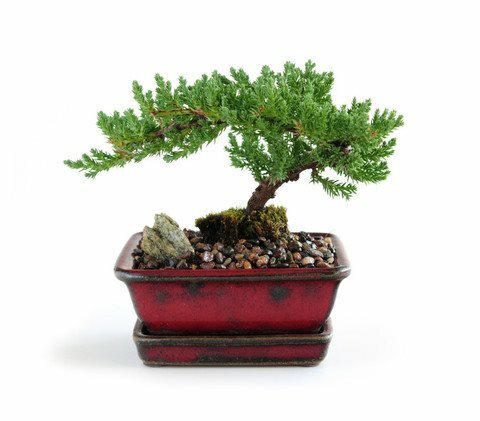 The Juniper Bonsai is one of the best and most rewarding plants for any man, and here at Metropolitan Wholesale we can make sure your guy gets one he will cherish for years and years.